Minibus World offers tailored Minibus Leasing for schools, charities and businesses who are looking to lease and operate their own minibus. 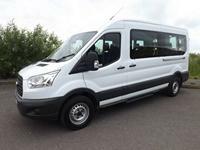 We lease and manage a fleet of small to medium 3 to 17 seat standard and accessible minibuses providing servicing and maintenance agreements nationwide. 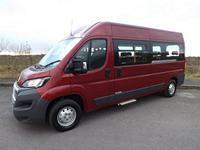 We are also a manufacturer of Peugeot Approved Minibuses. Our dedicated account managers provide regular communications regarding service intervals and maintenance and ensure proactive follow up in terms of monitoring your vehicle on your behalf. 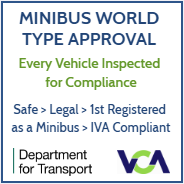 This ensures that we provide the same level of service to individuals and fleet customers alike. In our experience on a normal minibus lease agreement you would be dealing with at least three organisations including the supplier of the vehicle, the converter and the leasing company. Minibus World are a one stop shop and you would deal solely with us as we are the supplier of the vehicle, conversion and lease. The type of leasing that's best for you depends on the type of school or organisation you are, and your priorities. Schools and academies are not allowed to borrow for Hire Purchase or Finance Leasing, so an Operating Lease or Contract Hire are your choices. Leasing and Contract Hire both offer the advantage of fixed monthly costs and a low initial outlay. One of the greatest benefits to minibus leasing rather than ownership is knowing that your monthly outlay is fixed, which is great for your budgeting and cash-flow. Leasing and Contract Hire both offer this. Contract Hire typically includes maintenance and running costs except insurance and fuel. Hire Purchase and Finance Leasing both allow you to own your vehicle at the end of the term, but are not available to state schools or academies. 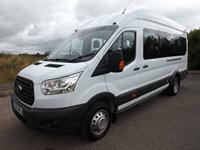 Don't worry, if you can't wait for us to build a Minibus to your exact specification we have stock available for IMMEDIATE DELIVERY or in build to supply over the next 4 weeks. Can't see what you're looking for? 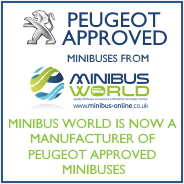 As an approved Peugeot converter we have a steady supply of vans on order, and could still supply your minibus in time for your needs. We sometimes have slots allocated to stock builds that we may be able to swap in order to supply what you're looking for quicker. 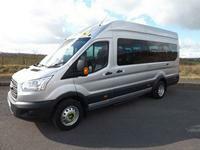 Call us on 01782 444 289 or email webenquiry@minibus-online.co.uk for more information. 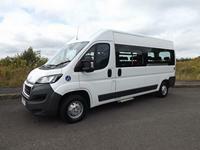 Contract Hire - Suitable for all types of schools, charities and businesses. Everything is organised for you and managed on your behalf - this makes Contract Hire an ideal, hassle-free way to run one or several minibuses. Typically your agreement includes maintenance, road fund licence and MOT; you just add fuel and insurance. With a low initial outlay, fixed payments and the option to hire over 3, 4 or 5 years Contract Hire is a cost effective option and our most popular choice. Operating Lease - Suitable for all types of schools, charities and businesses. Offers the advantages of a low initial outlay and fixed monthly payments. An Operating Lease does not include maintenance and you would manage and pay for annual servicing, repair costs, road fund licence and MOT. Finance Lease - Suitable for independent schools, charities and businesses but not state schools or academies. 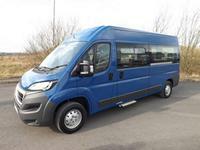 Offers low initial outlay and fixed monthly payments that cover the cost of the minibus. 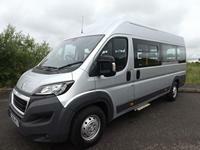 You have the option to purchase the vehicle at the end of the agreement or return the minibus to the lessor. A Finance Lease does not include maintenance and you would manage and pay for annual servicing, unforseen repair costs, road fund licence and MOT. Why Lease From Minibus World? We have access to the best rates available in the UK and offer competitive pricing for minibus leasing and contract hire options. We are corporate members of the British Vehicle Rental & Leasing Associations (BVRLA) and follow their codes of conduct. We are authorised by the Financial Conduct Authority. We are the only minibus leasing supplier who currently custom-build and brand your minibus; your manufactured minibus can be branded to match your corporate or school identity - this includes colour-coordinated seats to match your logo or school crest. For example, if your school crest is red and blue you can have red seats with blue belts and piping. We're minibus leasing experts who understand your needs and offer the personal touch. 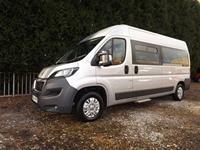 With many years of experience, we are well placed to offer advice on minibus leasing. Over half of our customers are returning customers or recommendations. Based in the heart of the UK we offer excellent lead-times, stringent safety testing and free of charge nationwide delivery. 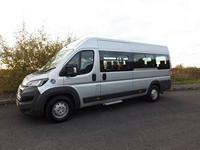 Browse our range of minibuses for lease, contact us or call us on 01782 444289 for a quote.